I hope you’re ready for a challenge, because the Paper Craft Crew has a great one for you this week! I have to admit – this one had me stumped for a while! I don’t have any stamps of ‘summer food’, and I couldn’t for the life of me figure out how to make my own (my back is finally getting much better, but it really is a distraction); I personally don’t like using staples on my cards (I know, it’s a trend…), and I couldn’t think how to add washi tape to seashells and any blue! I first started by creating my background; I took a panel of Whisper White cardstock, and used my Stamping Sponges with Crumb Cake ink for the shore, Dapper Denim for the water, and combined Daffodil Yellow and So Saffron for the bright sky. Using the 2-step starfish from the Picture Perfect stamp set, I stamped first in Crumb Cake ink, then the 2nd step in Elegant Eggplant ink. We have a lot of these purple-ish starfish here on the West Coast; I think that’s why I’m always colouring them purple. To create the little whitecaps in the water, and bubbles in the sand, I used my (retired) White Signo Gel-pen to draw the lines and dots. I mounted the stamped panel onto a panel of Dapper Denim cardstock, then wound some Linen Thread around the top, then glued the card front to my Crumb Cake cardstock base. I created a small banner of the new 5/8″ Burlap Ribbon (I love the loose weave of this one! ), by using my Paper Snips to cut a tail at one end, and attached it over the Linen Thread using Glue Dots. 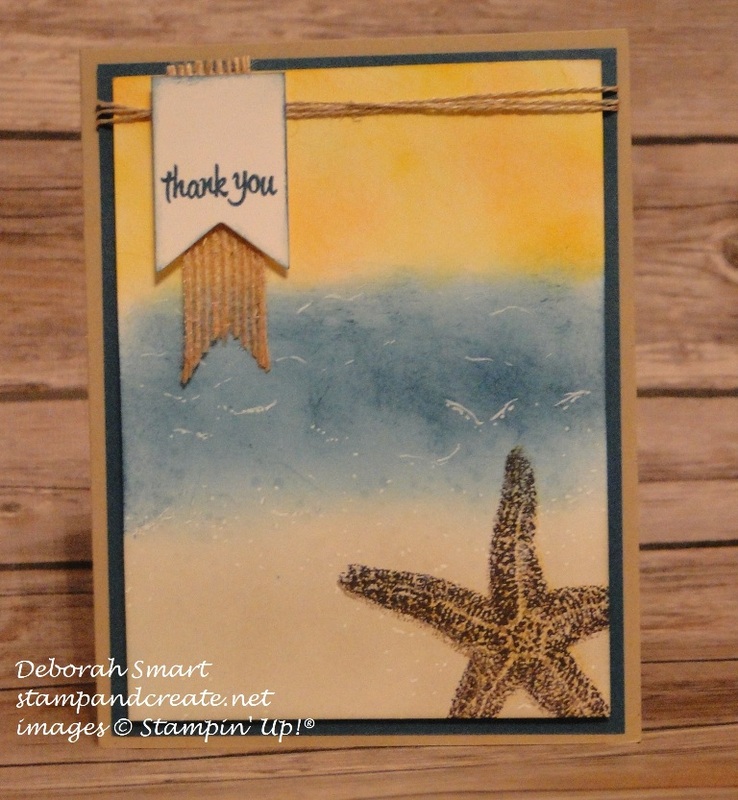 The sentiment was stamped on a small piece of Whisper White cardstock in Dapper Denim ink; I then used my Sponge Dauber to add some of the ink around the edges. The sentiment was then attached using Stampin’ Dimensionals, over the Burlap Ribbon. An aside here – some people ask me why I have both Stamping Sponges, and Sponge Daubers, especially when I have one each of each colour. Well, it’s because when you use each to apply the ink to the cardstock, each one gives a different look and texture to the result; the Daubers are much more dense foam, so they apply the ink differently than the Sponges, which have large open ‘pores’, just like a sea sponge. I hope you’ll find some inspiration in what the rest of the Design Team have put together for you; click on over to the Paper Craft Crew Challenges blog, and have a look. Then, put your card together, and link up for the challenge. I can’t wait to see what YOU create! Next Next post: New Catalogue & New Special Offers!